Painter, M.f. and Dan Cooligan. "Silviculture". The Canadian Encyclopedia, 04 March 2015, Historica Canada. https://www.thecanadianencyclopedia.ca/en/article/silviculture. Accessed 18 April 2019. Silviculture is the branch of FORESTRY that deals with establishing, caring for and reproducing stands of trees for a variety of forest uses including wildlife habitat, timber production and outdoor recreation. Silviculture is the branch of FORESTRY that deals with establishing, caring for and reproducing stands of trees for a variety of forest uses including wildlife habitat, timber production and outdoor recreation. It requires a knowledge of how various TREE species grow under particular conditions of SOIL, CLIMATE and spacing. Silvicultural systems blend harvesting (see FOREST HARVESTING), regeneration (eg, site preparation, tree planting, seeding), tending (eg, weeding, spacing) and protection from insects and diseases into a series of forest management operations. In general, forests are managed under one of 3 silvicultural systems: the clear-cut silvicultural system, the shelterwood silvicultural system and the selection silvicultural system. In the clear-cut silvicultural system, harvesting and forest renewal activities are designed to emulate natural disturbances, such as fire, insects, flood and wind, and to protect local values. Most boreal tree species (see BOREAL FOREST), such as ASPEN, PINE and BIRCH, do not grow well without full sunlight. These trees are well adapted to natural disturbances and often form single or mixed species stands of the same age. The life cycles and ecological characteristics of these trees make the clear-cut silvicultural system a suitable method of harvesting and regenerating forests. In the shelterwood silvicultural system, mature trees are harvested in a series of operations. The first removes part of the original stand to promote the growth and seeding ability of the remaining trees. Regeneration usually takes place naturally from their seeds. When seedlings are well established, the mature trees are removed to let the new forest grow. In the selection silvicultural system, individual trees or small groups of trees are cut. Regeneration takes place naturally from stump or root sprouts or from seeds from the remaining forest. In the selection and shelterwood systems, it is usually left to nature to provide new seedlings. Although natural regeneration is often successful in the clear-cut silvicultural system, artificial seeding or planting is sometimes needed to satisfactorily reforest a site. Forest managers must decide the species and tree spacing most suited to the particular area. They must also predict the effect of operations on a variety of forest values including wildlife habitat, BIODIVERSITY and timber yield. Until recently, seedlings were always grown from ordinary tree seed collected from natural forests. Silviculturists are increasingly using genetically improved seed from superior trees to establish healthier and faster-growing forests. Improved seed is cultivated in "seed orchards" where genetically superior trees are grown to produce seed for forest renewal. 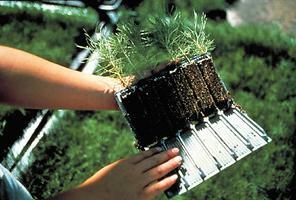 Tree seedlings are grown in nurseries or greenhouses before being planted out, usually in spring or fall. Sometimes it is necessary to clear brush or surface litter from an area before the seedlings can be planted. This site preparation may be done mechanically, with fire or with chemicals. Once tree seedlings are planted, several other steps may be taken to tend the stand. At all stages of growth a FOREST is vulnerable to damage by fire (see FOREST FIRE), INSECT PESTS or PLANT DISEASE. It is important in silviculture to protect timber stands from these enemies. Since young seedlings may also be suffocated by WEEDS and brush, it is also sometimes necessary to weed or "brush" a recently regenerated area. As the young trees get taller, reaching perhaps 3 or 4 m in height, they may overcrowd each other, and the stand will stagnate. In this case, it is desirable to thin the trees out, either mechanically (with axes or saws) or with chemicals. This operation is known as "juvenile spacing" or "precommercial thinning". When the trees are big enough to be used commercially, the stand may be thinned out one or more times before the final harvest. Other silvicultural practices that may be used include pruning to reduce the number of knots in the lumber, fertilizing (see FERTILIZER) to increase growth, and "sanitation spacing" to remove diseased or undesirable trees. Natural Resources Canada, Silvicultural Terms in Canada, 2nd ed, (1995).